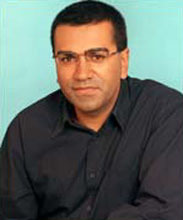 A British investigative journalist, Bashir left the BBC in 1999 to work for ITV, and in September 2004 joined the televised American news magazine 20/20. He softball-interviewed Lady Diana at one point. But he is best known for his Living with Michael Jackson special report, to which the Jackson camp responded with their own documentary, The Michael Jackson Interview: The Footage You Were Never Meant to See. Bashir later interviewed former child actor Corey Feldman, who spent perhaps too much time with the pop star as a youth. Bashir's investigative style can best be described as ethically troublesome, but quite entertaining. The 2005 prosecution of Michael Jackson dealt with events that purportedly transpired after the airing of the controversial 2003 special, which rather successfully made Jackson appear to be a child molestor. It strikes one as very odd that an individual in this type of spotlit juggernaut would commit these sort of crimes, but then a forty-six-year-old sharing one's bed with young boys is also... quite odd. Bashir went on to spend several years as one of the rotating anchorhosts on ABC's late-night chat show Nightline, before joining NBC News and MSNBC in 2010. That arrangement ended in 2013, after he suggested on air that someone should defecate in Sarah Palin's mouth.